Our impression of Pai. Is it really a hippie place? We decided to visit Pai because everyone kept saying how cool and Hippie-ish it is. I have been to Thailand before, but I have never been to Pai so I was really looking forward to seeing it this time with Peter. 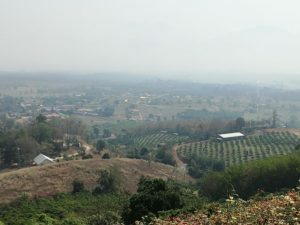 First of all, the road from Chiang Mai to Pai has 762 turns, and as I am not one to take long bus rides well, I felt sick almost the whole way there. Luckily I did not throw up like some fellow travelers on the mini bus. I thought Peter was taking it really well, but he actually told me when we finally got there that he was feeling sick too! We booked our first night online through booking.com as we knew we would get there quite late. The place was called Jungle Zone and we started looking for it straight away. 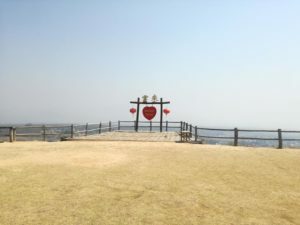 We were told that the place is actually about 5 km outside the town, which wasn’t mentioned in the description so we were quite surprised to hear that. We decided to just stay in town and try to find a place to stay in the town. We went into a restaurant on one of the main streets ran by Muslim ladies, who said they had a bungalow for rent in the back. It was quite cheap too, around £15 per night so we took it. The place was quite tidy although made of bamboo so anything that wanted to get in did so. I sent a message to the owner of Jungle Zone explaining what happened, and they were quite forthcoming as they offered us to come and stay another night. We didn’t use their offer though as we just stayed in the town for the whole of our stay. Our first impression of Pai was quite pleasant, the nature around the town was beautiful, the best thing to do there is to rent a motorbike and ride around. It’s impossible to get lost, as they say all roads lead to Pai. Ad they really do. I didn’t find it very hippie-ish, although they did sell a lot of cool stuff like the obligatory elephant pants and skirts and nice jewelry but then they do that everywhere in Thailand. If anything then I’d say the life of the locals revolves solely around tourism there, I could not really see anything authentic in the town itself. The surrounding villages kept their authenticity and those are worth visiting. 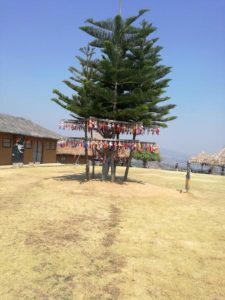 In spite of this Pai is a great place to visit and we loved it there (except for the episode with food poisoning). There is a Chinese village nearby that sells nice souvenirs and there is a hill you can climb up to (or ride your motorbike up the steep hill if you’re brave enough, which I wasn’t. Peter rode the bike and I walked behind him ). The view from the top is amazing, so worth visiting, even despite the 10 bath charge :). 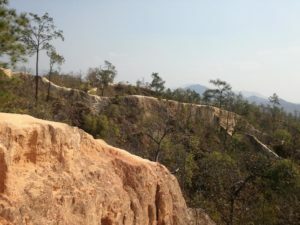 Pai Canyon is another thing worth visiting if you’re in Pai. It’s just off one of the roads near the town and it’s exactly what it sounds like – a canyon. The ground there is really dry and a reddish color and you will always meet some tourists there. 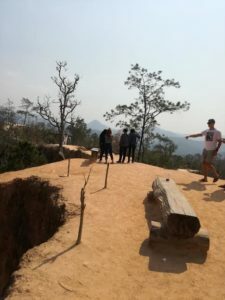 You can walk around it, some paths actually looked quite dangerous as they are very thin with a huge gap on both sides. So we walked around, but left out the dangerous parts. Another nice thing to see near Pai is the Landsplit. That’s also what it sounds like – a place where the land split a few times. A Thai family lives there and they welcome travelers. There is a chillout area with hammocks where they bring you all kinds of home made food and fruits grown right there in their garden. It’s all donation based and they’re really nice people. You can walk around the landsplit, they have some trees and plants labeled so you can see what a jackfruit tree (my favorite fruit) looks like. Our very best day in Pai was at the swimming pool. It was amazing just sitting there in the sunshine, occasionally dipping into the water, listening to the music coming out of the big speakers, drinking cocktails and watching people around us (I’ll tell you, the girls were hot!) So if you’re in Pai, do not miss the swimming pool. They do charge for entry, 60 bath per person, but you will have an amazing time chilling there. A weird thing about Pai was that there were so many single girl travelers. Never have we seen so many single girls in one place…do any of you know what it is about Pai that so many girls end up going there? 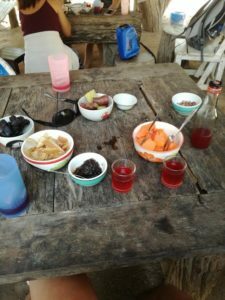 Read on about the food poisoning we managed to get in Pai.